Amy Houlston at Burgess sends news of a currency switch from Euros to dollars on the 47.15m sailing yacht Scheherazade, meaning an effective price reduction. Designed by Bruce King, this striking superyacht was built by Hodgdon Yachts in 2003 with a cold moulded hull in wood and epoxy and is Lloyds classed and MCA compliant. Her elegant interior by Andrew Winch accommodates seven guests in a master suite and two twin cabins plus a Pullman berth and she has a cruising range of 3,000 nautical miles at 11 knots. 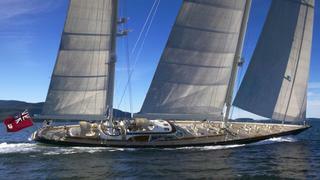 Subject to a comprehensive refit in the summer of 2011, Scheherazade is down from €16 million to $19.95 million.